What stops me from going totally vegetarian is my love of eggs and shellfish. That said, I can’t kill my food, so either I buy dead shellfish or do the hypocritical thing and let other people kill them i.e. eat in restaurants. No problem with prawns which can be bought dead, but to avoid contamination crabs and lobsters need to be alive just before they are cooked. Result: I never buy crabs. Anything breathing that comes into my home will be given a name and allowed to live out its natural life. Imagine George and Daisy, the Sri Lankan crabs scuttling around the backyard, waving their pincers menacingly at our stalking dogs. Someone will get nipped, and it’s 3-1 in the crabs’ favour. My friend Devagi Sanmugam recently posted a recipe for garlic-pepper crabs which got me drooling. 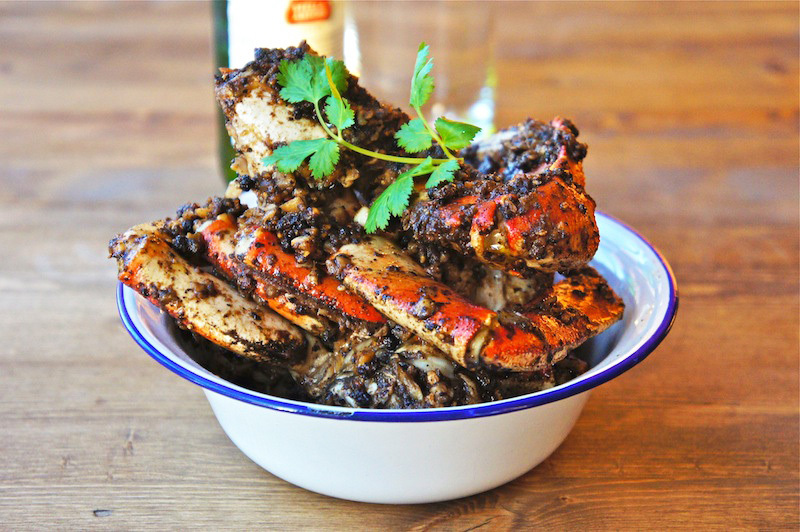 Butter crab, chilli crab, baked crab, curry crab, fried soft-shell crabs….love ‘em all! Your mouth watering? Here is Devagi’s recipe – http://spice-queen.com/garlic-pepper-crabs/. Unless it’s hanging on to my toe, nothing will induce me to kill a crab, so I will have to drool on. Heat oil until very hot (preferably in a wok) and then deep fry the crabs or crayfish until the shell changes colour. Melt the Q.B.B. Pure Ghee in a wok. Add in the chilli, garlic and ginger and sauté till aromatic – about 3 minutes. Add the oyster sauce, both soya sauces and sugar. Simmer for a few seconds and then add the black pepper. Continue cooking until the sauce thickens and then add the crabs or crayfish. Keep stirring until the crabs are well coated with the sauce and cook for another couple of minutes.